Writer's Digest Books, 9781599636887, 199pp. Real-world writing advice, minus all the lectures. You're an aspiring writer. Maybe you've just discovered your love of words and dream of being a novelist someday. Maybe you've been filling notebooks with science-fiction stories since middle school. Maybe you're contemplating a liberal arts degree, but you don't know what the heck you're going to do with it. The last thing you need is another preachy writing manual telling you how you should write. Don't have enough time to write? Learn how to plan your days to fit it all in. Not sure how your guilty pleasures and bad habits translate into literature? Kerri explains how soap operas and eavesdropping can actually help your writing. Need a reader for your first novel? Find a writing buddy or a writing group that will support you. Nervous about submitting your first piece? Learn from Kerri's own roller coaster journey to find an agent and get published. 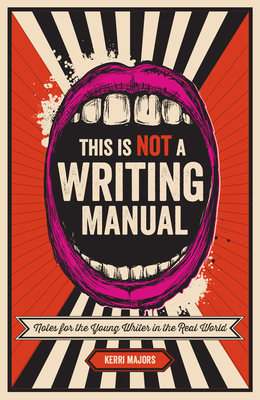 This Is Not a Writing Manual is the writing memoir for young writers who want to use their talents in the real world. ATTENTION TEACHERS The Teacher's Edition for This Is Not a Writing Manual is now available This FREE supplemental PDF includes a series of lesson plans and writing class essentials that will improve the writing of students in middle and high school--and beyond. To access, e-mail us at writersdigest@fwmedia.com to receive your free download, or visit Kerri Majors's website. Kerri Majors is the Editor and Founder of YARN, the Young Adult Review Network (www.yareview.net), an online literary journal of YA short stories, essays, and poetry, which won an Innovations in Reading Prize from the National Book Foundation. Kerri's short stories and essays have appeared in journals such as Guernica and Poets and Writers. She is a graduate of U.C. Berkeley, has an MFA from Columbia, and now lives in Massachusetts with her husband, Mike, and their daughter. You can find out more about her at www.kerrimajors.com.